Rating 6.538843 stars – Golden Pip! 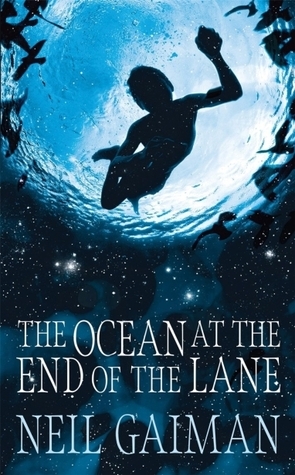 After my 985th read through, The Ocean at the End of the Lane has just become my favourite novel of all time. It has knocked Skellig off the number one spot. Sorry not sorry Skellig – I still love you, I just love another more. I love Ocean so much I want to kiss it, and hold hands with it and have babies with it and apply for a mortgage with it and holiday in the south of Wales with it and buy it birthday presents and argue over what we are having for dinner with it and share a car with it and tolerate it’s parents and cut the grass whilst it sunbathes in the garden and oh my! During a visit to his childhood town for a family funeral, the narrator (we don’t learn his name) is drawn down a lane to an old farmhouse, which has a large lake/pond (some say ocean) next to it. Whilst sitting on a bench, he starts to remember the fantastical events that happened to him when he was 7. Things that he had remarkably forgotten. Such as when a guest staying at the family home steals his dad’s car and commits suicide in it. This event wakes a being from another dimension who tries to help people, but ends up causing bother. The narrator meets three witches who live in the farmhouse. All sounds not too bad right? WRONG! The story takes a very dark turn and wonderful, scary, insightful and excellent things happen. Things I don’t like about this story: Nothing at all. Not a single thing. There is nothing negative about this story. – The Narrator. He’s such a relatable 7yr old. He loves books. He’s shy. He feels a little bit of an outsider. He appreciates little things in life (like having a small sink in his bedroom). He over thinks a lot of things. He has a great sense of fairness and appreciates kindness. He deals with very difficult, life threatening events with such courage. – The ending. I won’t say too much because, obvious spoilers, but the end is rather bittersweet and it is done gently and heartwarmingly and is full of satisfyingly pensive hope. – The worm scene! Trust me, read the book and you will see why it is wonderful. – The writing. I believe Neil Gaiman is the best writer of our time, and quite possibly of all time. Yes, I am a complete fanboy of Gaiman. I am in awe of his writing skill and his ability to wield words and language in such a dreamlike, poetic, fairy telling manner whist feeling modern and engrossing. I fall into his worlds so easily and always feel book drunk when I get to the end of one. Ocean has so many magical pensive moments and lines. I wanted to highlight a quote on every page, but resisted. There could literally be 900 highlights of wonderful text from this. Dinner was wonderful. There was a joint of beef, with roast potatoes, golden-crisp on the outside and soft and white inside, buttered greens I did not recognise, although I think now that they might have been nettles, roasted carrots, blackened and sweet (I did not think that I liked cooked carrots, so nearly did not eat one, but I was brave, and I tried it, and I liked it, and was disappointed in boiled carrots for the rest of my childhood). For dessert, we had the pie, stuffed with apples and with swollen raisins and crushed nuts, all topped with a thick yellow custard, creamier and richer than anything I had ever tasted at school or at home. Like, come on, don’t pretend you aren’t salivating over that. – The length. This may seem like an odd thing to like, but I have short term memory problems and so long novels can be difficult for me to read. At 246 pages, this is the perfect length so I can read it in one sitting, and remember enough detail to remain fully immersed in the story and world. – The audiobook. If you read some of my other reviews, you know I like audiobooks and switching between listening and reading. The audiobook is at a great 5hr sweet spot, and Gaiman expertly reading the story to you is a delight. I could ramble for much longer about how much I love this story, but I think you probably get it. I have so many good things to say and nothing negative. I’ve had porridge with honey and cream for breakfast. I’m going to have a fresh sandwich with good bread and tomatoes that actually taste of something for lunch. And I’m going to make roasted veg for dinner tonight. Peace and Love. I have just eaten and all the food in this post made me want to eat again. I’ve only read one book by Gaiman and I am sorry I haven’t made time to read more of his works… I have to rectify that! Every time I read this book I get mega hungry! Which Gaiman book have you read? I’ve read most of his stuff – there are a couple I just haven’t got around to. I love Gaiman, he’s probably my favourite author. I’ve read The Graveyard Book- really really liked it 🙂 Got a ton of recommendations from others then on what to read next by him but haven’t got around to any of them yet myself. Hahaha… third favourite thing… Dare I ask what the first two are? Oh yes, I now remember reading your review. Me and my forgetful brain! I love the graveyard book! Bod is such a delight. I’d recommend either Ocean or Stardust next. They are both written with a similar style to Graveyard. Favourite things to do: 1. Reading. 2. When I am on the train (which is a lot) I like to pretend the ground is lava and imagine how I would manage to get from one train station to the next. Normally it goes something like ‘Jump from platform to wall. Shimmy along wall to fence…’ etc. I rarely manage to do the whole journey without getting stuck. Ha… of course, I should have known reading would take spot nr 1… Nr 2? This sounds interesting- you’re doing a bit of Matrix there… I look forward to the day when you have mastered the whole journey without getting stuck! 😀 It’ll be historical for humanity! Thank you! Which Gaiman book have you read? A human/book hybrid would be a great thing. I hope someone is funding research into that somewhere. Cool review. I am unfortunately the same as the young Sprog (Jazz) and have only read one Gaiman book and it was Norse Mythology, which I loved. He’s an author I’ve always wanted to read more of but due to time have never gotten around to it! Do you listen to audiobooks? Gaiman narrates his own books and he does a really good of it. I don’t no, never been able to get on with audiobooks! Ah, that’s a shame. They are not for everyone.